"Aransas Pass was hit hard by Hurricane Harvey and many have suffered devastating losses. 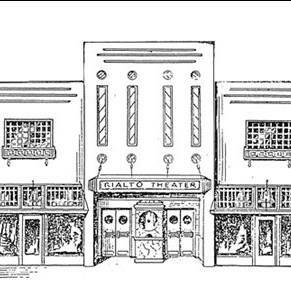 We can gratefully report that the Rialto Theater is still standing, mostly intact, but she has suffered roof and water damage that will take some time to repair. As soon as we can report further, we will keep you informed. To all our loyal volunteers and patrons who have suffered much during this catastrophe, we wish you well, safe and strong as you face the days and months ahead. TEXAS STRONG was never more true! "The Aransas Pass Rialto Theater was built in 1937 by Hall Industries Theatres, a company that owned and operated several theaters in the South Texas region at that time. Owned by H. W. Hall, the company was headquartered in Beeville, Texas. The grand opening was on November 5, 1937. The original theater seated 460 people in "air-conditioned comfort", which on the Texas coast at that time was extremely rare. Upholstered seating and an elevated incline, permitting an unobstructed view of the screen, were also offered to theater patrons and much publicized. The first manager was Wallace Witt. He lived in the apartment adjoining the projection room on the second floor. The theater operated until the early 80's when the doors closed for good. February, 2004 brought a change in ownership. The long-neglected building is currently under renovation. It's returning to its roots as a community forum for the arts. Contemporary visual and performing artists will soon walk its stage. The building will house art galleries, working studios and a performing arts space seating approximately 100 people." Below is an excerpt of a later news release. Regrettably, very little of anything in print from the early years was recovered when Jen Rubinowitz purchased the Rialto and began her rebirth to the performing arts venue that proudly stands today.